Hay rides. Dunking booths. Corn mazes and concerts under the starlight. Giant pumpkins and even gianter pumpkin pies. The scent of fried foods wafting through the air, mingling with animal poop, and clinging to your hair, your skin, and your clothing…long after the fourth wash. Ahhhh. The Pawnee Harvest Festival. That’s the stuff. Staples of the Pawenee foodie community Sweetums and J.J.’s Diner each have booths at the festival, along with with (much-loathed) Sue’s Salads, (somewhat obscure) Happy Harriet’s House of Heaven, and one-two-twelve different sandwich shops. But wait! There’s more! Vegan Junk Food French Toast Mashup! This leftovers mashup dish combines the best of two worlds, both of which hail from the Lane Gold Vegan Junk Food ‘verse: the prep method from her Sticky Caramel Baked French Toast, paired with the flavors of her nearly-as-awesome (fried) Eggnog French Toast with Butter Rum Sauce. After I made the Eggnog French Toast last month, I ended up with a ton of extra Butter Rum Sauce. For a while I used it as a dipping sauce for a half batch of gingerbread cookies I’d made (the leftover dough from the Gingerbread Cookie Dough Ice Cream; hello, old recipes!). Then I got to thinking: why not use it in place of the Caramel Sauce to make Baked Eggnog French Toast? After all, both mixes contain the same basic ingredients, namely sugar and margarine. And for the top sauce, I used straight-up So Delicious coconut milk nog in place of soy milk (cutting down on the thickening agents appropriately), for more of that sweet Christmasy eggnog taste. And it worked! Sweet, sticky eggnog french: IN THE OVEN! No hot oil required. 1. Lightly grease a 9″x12″ baking pan. Pour in the butter rum sauce – about a cup, or just enough to coat the bottom of the pan. Arrange the sliced french bread in the pan, so that no pieces overlap. 2. In a small bowl or measuring cup, combine the nog, nooch, flour, cinnamon, and salt; whisk well to combine. Pour the nog mix over the bread. Let sit in the fridge for at least an hour prior to baking. 3. Bake at 350F for about 30 minutes, or until most (but not all) of the nog has cooked away and/or thickened into a syrupy consistency. Serve immediately! I have been waiting nearly a year to try this recipe, people! 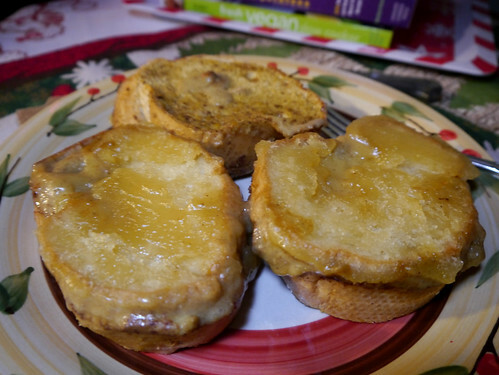 It’s the Eggnog French Toast with Butter Rum Sauce from Vegan Junk Food. 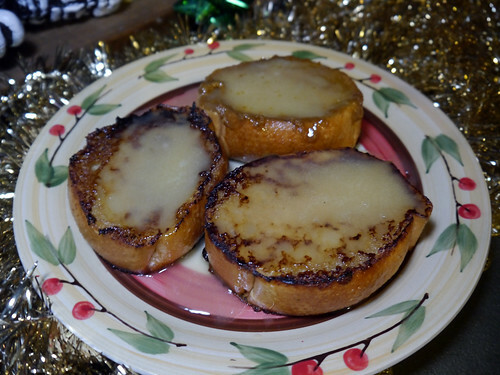 While ooey, gooey, and totally nom-worthy, it’s not quite as noggy as I’d hoped: the flavor of the Butter Rum Sauce totally overpowers the nog batter on the french toast. Still a pretty awesome french toast recipe, though the Sticky Caramel Baked French Toast will forever be my favorite. Key word: BAKED. Hot oil splatter be gone! * Actually I had this for dinner but who’s counting? 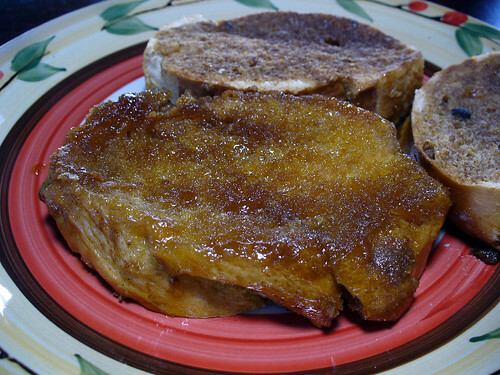 What vegans eat on Zombie Jesus Day: Sticky Caramel Baked French Toast! You’re supposed to assemble this dish anywhere from an hour to half a day in advance, so that the bread can soak up the caramel sauce and cinnamon vanilla batter. Make it before going to bed and the next morning you’ve got a hot, sweet breakfast in thirty minutes or less. Bake in while you’re in the shower for maximum time efficiency. You’re welcome! This bog, by the way? 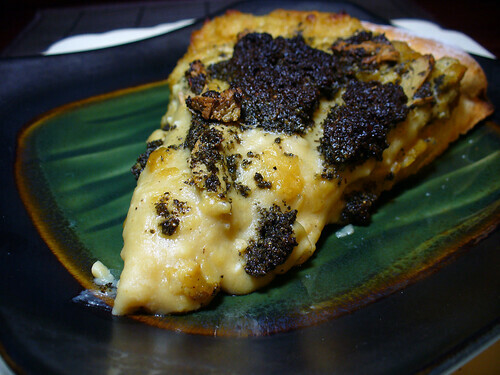 Is now officially a food blog. All vegan food, all the time. No regrets. Vegan Junk Food Cookbook Review: Riots, not diets! 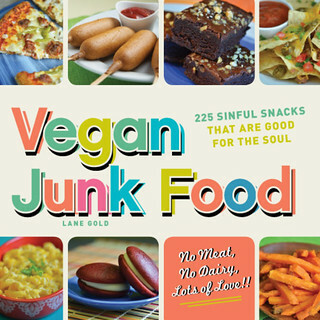 Lane Gold’s Vegan Junk Food is my new favorite cookbook. (The previous title holder? Wheeler del Torro’s The Vegan Scoop – which should tell you a little sumthin’ sumthin’! Namely, that I like my vegan food filled with empty calories.) At my request, I was lucky enough to receive a review copy – along with two copies to give away – from the publisher, Adams Media. With a name like “Vegan Junk Food,” I figured it couldn’t disappoint. Whether you like your junk food sweet or savory, chocolaty or cheesy, Lane (can I call you Lane?) has got you covered. The 225 recipes in this collection are divided into ten categories: breakfast foods; deli favorites (i.e., sandwiches, wraps, burgers, and sliders); comfort-meets-takeout foods (entrees); crusts and carbs (pizzas and breads); festive grub (party foods! ); dips, hummus, and sauces (including sundae toppings! ); savory treats; cakes; candies and cookies; and grab ‘n’ go sweets (brownies and bars). As you can see, the recipes are roughly divided between meal-type items (entrees, main courses) and snacks/desserts. The husband and I tried out about twenty recipes before I sat down to write this review; and, while I don’t usually review cookbooks, this is easily the largest number of recipes I’ve sampled for a cookbook review, like, ever. (I just couldn’t stop myself; everything looks so good!) Possibly it’s the most recipes I’ve made from a single cookbook, period. Though I own a ridiculous number of them, I don’t use cookbooks with much frequency; more often I cook from memory or pull recipes off the internet. But Vegan Junk Food? Most definitely joining my repertoire! The book’s obvious strength, of course, is the food: oodles and oodles of junk food! Pizza. Pasta. Tacos. Pot pies. Casseroles. Cupcakes, pies, and brownies. Empty calories as far as the eye can see! Wait, that’s not entirely fair: some of these foods aren’t all that bad for you. Ironically, many of the recipes in Vegan Junk Food are actually healthier than my own versions. The Mac and Cheese Bake, for example, uses a vegan Velveeta-like cheese sauce made of potatoes, carrots, cauliflower, nutritional yeast, and soy milk. Even factoring in the additional vegan cheese shreds in this dish, it’s still way better for you than my own mac & cheese recipe, which is basically just pasta and processed vegan cheeses (namely, Daiya and Follow Your Heart). Don’t let the book’s title fool you: while these foods may look and taste like junk food, they’re not all super-trashy. With options for breakfast, lunch, dinner, and dessert, Vegan Junk Food is versatile. Mix and match the recipes for something new – or experiment to make them your own. 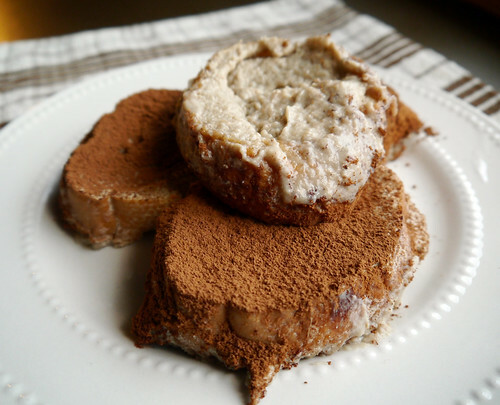 For example, I used leftovers from some of the recipes to create new banana ice cream dishes! While some of the recipes call for pricey vegan meats and cheeses, Gold doesn’t rely on these products exclusively. (Unlike the PPP blog, Vegan Junk Food doesn’t read like a Lightlife ad!) In fact, she offers diy recipes for many of these vegan staples so you can make ’em your own bad self, oftentimes at a fraction of the price! See, e.g., gravy (page 61); ricotta (pg. 120); sour cream (pg. 120); cheese sauce (pg. 121) basil pesto (pg. 124); and ranch dressing (pg. 126), to name just a few! My complaints are few and relatively minor. Some recipes reference other recipes – to return to the Mac and Cheese Bake, the Cheese Sauce is its own recipe, located in a different section of the book – but don’t include a page number alongside the recipe title, thus forcing the reader to consult the index in order to find it. A minor annoyance, compounded by the index’s lack of user friendliness. (I find it counter-intuitive and difficult to use.) An estimated cook time and rating for difficulty on each dish would have been nice too, but I suppose both are easy enough to gauge by reading through the instructions. I also ran into issues with two of the recipes – the Almond Joy Bar Cake and the Red Pepper, Caramelized Onion, and Hash Brown Quiche – which I’ll explain below. Still, out of twenty recipes, two small glitches? Not so bad! Especially when you consider my lackluster track record with baked goods. Brownies, why you no like me? What follows is a run-down of all the dishes I’ve tried thus far. I’ve only tackled about half the items on my to-do list, so I’m far from done with this cookbook! I’ll post additional pictures as I take them, so keep an eye out for those. 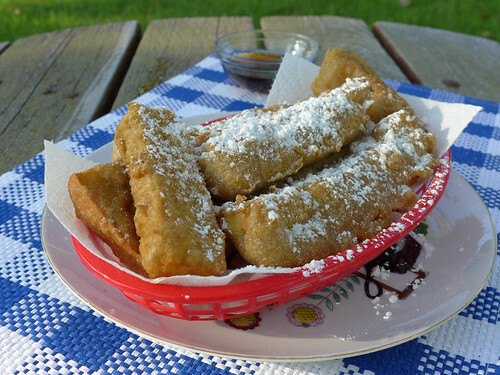 This was the first recipe we tried out, and quite possibly it’s also my favorite! The pureed white beans, seasoned with vegetable broth, nooch, and garlic, makes for a savory and filling pizza sauce, and the Basil Pesto is simple yet delicious. Enjoy this pizza with a fork and bib, though – it’s a messy one!